How do I establish Casino credit? A credit account, which is for casino markers and check cashing purposes only, can be applied for online. The information you submit online will be processed, but credit cannot be issued until you present your photo ID at the Main Casino Cage for verification. Must be 21 to apply. How do I become a member of your slot club? Join our M life program, or just stop by the M life booth at Excalibur to sign up or go to mlife.com. Must be 21 to apply. How do I obtain house rules on Poker? You may contact our Poker Room directly at 702.597.7625 or ask any of our friendly dealers when you arrive. How old do I have to be to gamble? Gaming law requires guests to be a minimum of 21 years if age to gamble and identification is required. Can I make multiple reservations under the same name? Our Internet site will allow you to make multiple reservations under the same name but room reservations will contact you via e-mail for names of the guests occupying the rooms. How do I upgrade my room? Do you have smoke-free rooms? Excalibur Hotel & Casino rooms are smoke-free. Smoking is permitted throughout the Casino Floor, stand-alone bars and other designated areas. How do I make changes to my room reservation? If booked directly with Excalibur, please call 1.800.879.1379 for information about changes, requests, restrictions and cancellations. Can I store my luggage overnight at the Bell Desk? 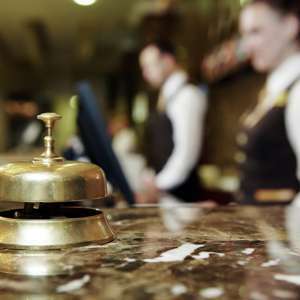 Yes, for a daily fee, registered hotel guests can store luggage overnight at the Bell Desk. Guests must produce a reservation confirmation number to be eligible for this service. Any luggage left at the Bell Desk without prior overnight arrangements may be taken to Lost & Found. Please inquire with the Bell Desk regarding storage pricing and arrangements for this service. Excalibur requires a minimum of 72 hours notice prior to your scheduled arrival date for a a full refund. How do I obtain a confirmation for my room reservation? If your room reservation was booked online, a confirmation will be e-mailed to you. If you booked your reservation over the phone, please call 1.800.879.1379 and a confirmation can be emailed to you. For complete details on parking, please visit the Excalibur parking information page. Do you offer hearing impaired rooms? Yes, TDD/TTY devices are also available and require a credit card deposit for use. All standard quest rooms come equipped with the following: Alarm Clock Wake up calls are also available through the Hotel operator. Cable TV featuring: NBC, ESPN, FOX, ABC, WTBS, CBS, TBS, Telemundo, VH1, WGN, MTV, MYLV TV, ABC, Univision TNT, MSNBC, E!, LIFETIME, ESPN2, CNN Headlines, AMC, Weather Channel, CWLV, Discovery, E & E, Fox News, Nickelodeon, Comedy Central. Hair Dryer, Iron with ironing board, Shower, Pool Area access. How do I add an additional name to a reservation? If you booked directly through Excalibur, please call 1.800.879.1379. If you booked through a travel agency, please contact them directly. Early check-in prior to 3 PM and is available on a day-by-day basis or an additional charge of $20. 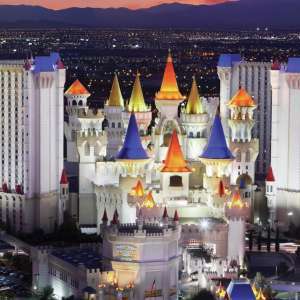 If you book on Excalibur.com and find a lower rate for the same dates at a later time, call 1.877.750.5464 and we'll be glad to lower your rate ($10 change fee applies). How do I reserve 10 or more hotel rooms? Late check-out at 3 PM is available for a fee. Please call 1.800.879.1379 for availability and rates. Check-in time is 3:00 PM, and check-out is 11:00 AM. As Excalibur is a gaming establishment, you must be minimum 21 years of age to check-in to a guest room. Do you have wheel chair accessible rooms? What is the temperature in Las Vegas? Do you rent wheelchairs or auto-chairs? Yes, however availability is limited and is on a first-come-first-serve basis. If you do require mobility assistance please contact the Bell Desk for more information upon arrival. Do you have a wedding chapel? Do you offer Internet service in the guest rooms? Yes, wi–fi access is available as part of the daily resort fee. Yes, it is called The Spa at Excalibur. Guests must be a minimum of 18 years of age to use the facilities. Is transportation available to/from the airport? Yes, transportation is available to/from the airport. Please visit the Concierge Desk to make a reservation. Do you cash foreign currency? Where do we cash in the currency? And what is the rate? Is there a rental car agency in the hotel? Avis is located in the tour lobby near the Rotunda and rear entrance. Their hours of operation are 6:30 AM to 3:30 PM daily (closed noon - 1 PM for lunch) and can be contacted through their website. How can I make tour and travel arrangements? Our Concierge can assist you with tours to the Grand Canyon, Zion, Hoover Dam and their surrounding areas. Excalibur does not offer childcare. There are several licensed and bonded services listed in the phone book. Does Excalibur sell Gift Cards? Yes, Excalibur gift cards are available for purchase at our wedding chapel and our spa. To purchase by phone, dial 1.800.811.4320 or 702.597.7278. Gift cards cannot be used for gaming. Gift cards are accepted at participating merchant and restaurant outlets. Do you cash traveler's checks, and is there a charge for doing so? We cash traveler's check at the casino cage and there is no charge for this service. Can I send and receive faxes at the hotel? Yes, our Front Desk fax number is 702.597.7009. Excalibur guests can receive faxes at no charge. There is a fee to send faxes. This price is subject to change at any time. TO SEND: $1.99 to send per page in either U.S. or internationally. How do I get luggage assistance when self-parking? Pull into the main entrance off Tropicana Avenue, drive into the thru-traffic lane, and follow the direction of the staff. A baggage handler (8:00 AM -1:00 AM daily) will assist you, issue a luggage claim ticket to retrieve your luggage item(s), and provide directions to the self-parking facility. To have your luggage delivered after you have arrived at your room, call the Bell Desk at extension 7241 and a bell person will then bring your luggage to you. An adult must be present at the time the service is requested. Unattended/parked/staged vehicles are prohibited in the main entrance. How do I get assistance with my luggage item(s) when departing from my hotel room? Call the Bell Desk at extension 7241 (24 hours daily) for luggage assistance to taxi, self-park, valet, shuttle, main entrance, ride-share, or for short-term storage until you depart the hotel. An adult must be present, have luggage item(s) packed and ready for pick-up at the time the service is requested. A bell person will issue a luggage claim ticket to retrieve your stored luggage item(s) at the Bell Desk. How do I get luggage assistance when valet parking? Pull into the main entrance off Tropicana Avenue and drive into any of the valet drop off lanes. Please let the valet attendant know you will need luggage assistance and a baggage handler (8:00 AM -1:00 AM daily) will assist you, issue a luggage claim ticket to retrieve your luggage item(s) and provide directions to the hotel lobby. How do I get assistance moving my non-luggage items from the convention/meeting space? Call the Bell Desk at extension 7241 (24 hours daily) for assistance moving non-luggage items from the convention/meeting space. An adult must be present, have item(s) packed and ready for pick-up at the time the service is requested. • Items of 1 – 4 pieces are $2.00 for each item. • Items of 5 or more pieces are a flat $20 cart fee. In the event more than 1 cart is needed to transport items the $20.00 cart fee will apply for each additional cart that is used. Fees apply for each individual move to or from the convention/meeting space and can be paid via cash, room charge if the guest is registered, or PM (payable at Front Desk) for non-registered guests or 3rd parties accessing banquet areas for functions such as DJ’s, outside floral, etc. Is there a business center at the resort? Can I send myself a package to the hotel? The Business Center is located at the Front Desk next to Concierge. Please send an email in advance of your arrival and shipping of any packages sent to the hotel. Include your Hotel Reservation number on all mailing labels of package shipments. All prices subject to change. Shipments into and out of the Excalibur Hotel are subject to receiving and handling fees in addition to the transportation charges incurred for shipping, regardless of the transportation carrier. Receiving, delivery, handling, and/or storage fees are payable at the time of initial service. Please Note: Packages will only be available for pickup during Business Center Hours. Business hours are 8:00 AM to 8:00 PM Monday - Sunday. Shipping and handling fees, Mailing Services Providers, and additional information can be found on the website here. Can I request a donation from Excalibur? The social investments made by MGM MIRAGE are dedicated to strengthening the communities where our employees live, work and care for their families. For this reason our charitable contributions are focused in Nevada, Mississippi and Detroit, Michigan and our giving areas focus on development of at-risk youth, public education, community development and diversity. If your request falls within these geographic and giving priorities, please visit our website at www.mgmmiragevoice.com for more information. Whatever you desire, the Concierge at Excalibur is here to assist. Our M life program is the ultimate way to do what you love – and get rewarded for it.